The International Triathlon Union (ITU) notes that 2018 is a busy year for the sport of triathlon and brings with it a ‘calendar of events to whet the appetites of triathlon fans the world over’. ITU competitions will traverse the continents of the globe, including 8 World Triathlon Series, the Mixed Relay Series, 18 World Cups and a host of Paratriathlon races as well as major multi-sport competitions such as the Commonwealth, Youth Olympic Games and ITU’s World Multisport Championships Festival. Here is the month-by-month breakdown of some of the highlights. The year got started in grand style in the heart of Romania, when Cheile Gradistei’s Resort Fundata hosted the Winter Triathlon World Championships from 26-28 January. The Elite and U23 races comprised a 7.5km run, 13.25km bike and 10km cross-country ski, and there were also Junior, Paratriathlon and Mixed Relay Elite and Junior races in the lee of the stunning Piatra Craiului and Bucegi mountains. The World Cup season kicks off on 11 February in Cape Town, South Africa, where the Elite men and women will get 2018 up and running under the watchful eye of Table Mountain. The opening race here in 2017 brought a dramatic finish for the women and a home one-two-three for South Africa’s men, and this year’s opener looks set to be every bit as entertaining. On 17 February, the Paratriathlon World Cup series gets underway earlier than last year, with Devonport, northern Tasmania, Australia, hosting this year’s curtain-raiser. Abu Dhabi will once again be the scene of the first WTS action of the year, where New Zealand’s Andrea Hewitt produced a grandstand finish to the women’s race in 2017 and Javier Gomez also began his season in style. All of the athletes will be keen to get 2018 off to a positive start in the UAE, before attentions turn back to the World Cup with two races – the first in Mooloolaba, Australia and the second in New Plymouth, New Zealand. The hotly anticipated 2018 Commonwealth Games take place in Australia’s Gold Coast in April, with the women’s sprint race (5 April) providing the first gold medal event of the entire Games. The men’s race will follow the same day, with the inaugural Paratriathlon and Mixed Relay events taking place two days later. April’s racing continues with the New Orleans World Cup (14-15 April), before the second stop of the WTS season in Bermuda (28 April). A busy May sees the Aguilas Paratriathlon World Cup take place in Spain from 5-6 May, while over in China the same weekend the Chengdu World Cup race will see another Super Sprint format across two semi-finals and a final. The Yokohama WTS and World Paratriathlon Series races hit Japan on 12-13 May, before the World Cup heads to Astana, Kazakhstan on the 20th. The venue for the London 2012 rowing competitions, Eton Dorney then hosts the Paratriathlon World Cup on 27-28 May. The focus is firmly on Europe in the first half of June, with the UK cities of Nottingham and Leeds hosting the World Mixed Relay Series and World Series on 6th and 9-10th June respectively. The World Cup season reaches the midway point with three races that could see this month have a major impact on the overall rankings; in the Italian city of Cagliari (2-3 June), Huatulco in Mexico (9-10 June) and the Belgian port city of Antwerp (16-17 June). The 2018 Paratriathlon World Cup moves on to Besancon in the east of France on 16-17 June, and the World Paratriathlon Series event in Iseo, Italy, wraps up an intense few weeks of action across the sport. The highly anticipated second edition of the ITU Multisport World Championships Festival heads to the Danish island of Fyn from 6-14 July, the torch having been passed on from the inaugural event held in Penticton, Canada, last year. 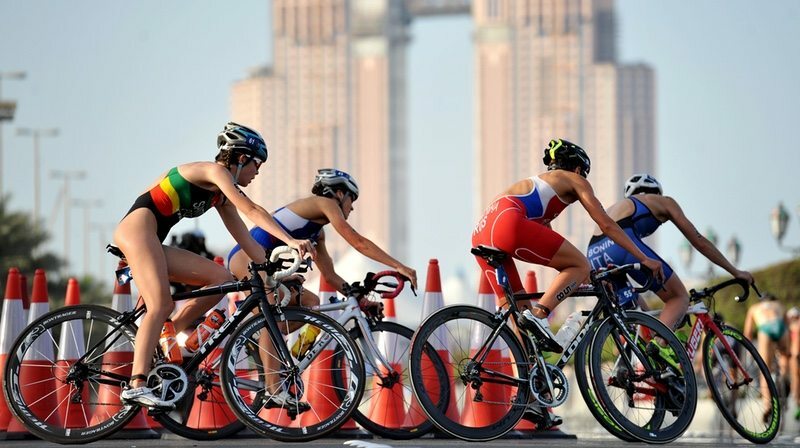 ITU World Titles will once again be up for grabs in duathlon, aquathlon, cross triathlon, aquabike and long distance triathlon, in a celebration of the growth of the sport. In the midst of the festival will be the Tiszaujvaros World Cup in Hungary from 7-8 July, ahead of the WTS Hamburg and Mixed Relay World Championships in the same city on 14-15 July. Edmonton, Canada, then hosts the WTS, World Paratriathlon and Mixed Relay Series from 27-29 July, rounding off a ‘breathless month for multisport fans and athletes alike’. The busy May-July period cools off a touch in early August, before the Lausanne Triathlon and Paratriathlon World Cups take the action to Switzerland from 18-19 August. The WTS series hots up once more in Montreal from 25-26 August as the athletes jockey for precious ranking points in their final race before the 2018 Grand Final. This year’s WTS Grand Final puts Australia’s Gold Coast firmly on the 2018 triathlon map once more following April’s Commonwealth Games. As well as the all-important elite events, races at U23, Junior, Para and Age Group levels will provide a feast of first-class sport over the five days. Before that, the Powerman Long Distance Duathlon World Championships are held in Zofingen, Switzerland, from 1-2 September, the same weekend as the Karlovy Vary World Cup in the Czech Republic and FISU Triathlon Championship in Kalmar, Sweden. September will also see Weihai, China (22-23) and the Spanish capital Madrid (29-30) host World Cup events. The headlines in October will be all about the 2018 Youth Olympic Games in Buenos Aires, with the triathlon events taking place between 7-11 October for the young athletes who made it through the continental qualifiers earlier in the year. World Cup races will be held in Sarasota USA (13-14), the Ecuadorian city of Salinas (20-21) and South Korea’s Tongyeong (27-28) as the season reaches its climax, and the ITU Paratriathlon year also closes out in Funchal, Portugal, on 27-28 October. Drawing a close on a busy year, the Japanese city of Miyazaki brings the World Cup season to a close for the third year running on 3 November, as this year’s 18-stop tour culminates with all of the athletes looking to round off 2018 with a podium finish and head to the close season to reflect on their achievements across what will be a packed year of world-class events.